Of all of Boston's transit lines, the Orange Line has by far gone through the most changes. The Orange Line Boston's riders knew until 1987 was radically different from the Orange Line Boston's riders know today. Until 1987, the Orange Line was an elevated train, similar to the "Els" in New York and Chicago, that ran above Boston's Washington Street from Jamaica Plain through Roxbury and the South End to the Washington Street Tunnel downtown, where it continued underground until North Station. Washington Street Elevated running over the South End. Thank you John Kyper for providing me with the photo! From North Station onward, the train continued to Charlestown and Everett as another elevated train until 1975, when the northern elevated structure was torn down and replaced with a private right-of-way to Malden through which the Orange Line runs today. 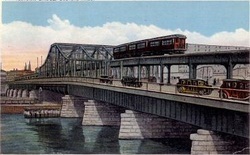 Charlestown Elevated running over the North Washington Street/Charlestown Bridge in 1929. 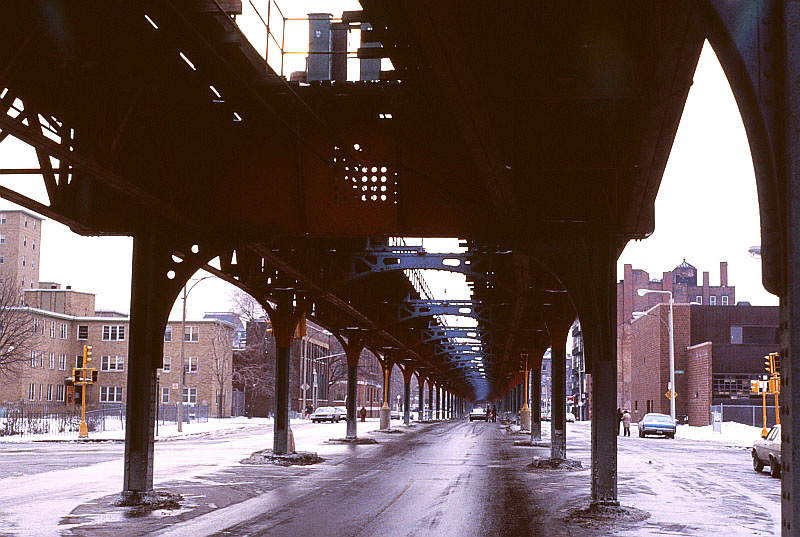 The "El" over Washington Street in the South End in 1979. Image copyright Frank Florianz. Southern Orange Line—New train on left, old train on right. Note the distance between the two trains. Northern Orange Line-New train on left, old train on right. Note how close the two trains are to one another, and how the new train serves the old areas and extends service to new ones as well. 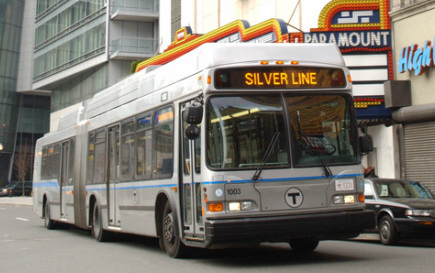 In order to bring local public transportation back to the Washington Street Corridor north of Dudley Square, the MBTA opened a new line, the Silver Line, in 2002. The Silver Line replaced the 49 bus, which temporarily served the corridor, and improved upon the bus by running buses along dedicated red bus lanes on Washington Street from Dudley Square to downtown, thereby speeding up service closer to the speed of the old elevated train. A Silver Line bus on Washington Street downtown. Image courtesy Boston Transit Library. I will soon upload a video of the Silver Line running along the dedicated bus lane.